The Alberton area is at the junction of the Albert and Logan rivers and ‘Alberton’ was originally a place name used for the planned town reserve.The Moreton Bay District opened for free settlement in 1842 and the first German settlers arrived soon after landing at Bethania in 1864. Between 1861 and 1891, some twenty-one thousand (21,000) German immigrants arrived in Queensland and settled in the Logan and ‘Lockyer districts and the Fassifern Valley. As early as 1863 the first settlers arrived in Alberton, the greater influx being from Germany. In 1865 a few people settled in our district and these were quickly followed by more families in 1868. The spiritual needs of these people were met by coming together in family groups under the shade of trees and in their rough makeshift homes. From among their possessions emerged hymn and devotional books, Bibles and musical instruments with which to praise the Lord. Life was simple but hard and fruitful throughout the region’s history. With pick, shovel, crowbar and strong back, people cleared and farmed the land and despite many problems were good, sturdy, plodding, self-reliant settlers. By sheer industry and economy, they made the land keep them while they cleared and brought more of it into cultivation, growing sugar, corn and small crops. People were content to make steady progress and not hanker after quick prosperity. The cattle they slaughtered and the vegetables they grew were shared amongst neighbours. They had a very hard life but the thing that kept them going was their faith in God and their attitude towards their fellow man. the first Cobb & Co coach travelling between Beenleigh and Brisbane. The first bridge across the river was erected at Yatala in 1876. When the church became too small a larger church was erected at the present site at Alberton in 1886 and consecrated by Rev.C.Hellmuth in January 1887 and incorporated under the name of St. Petrie. This early congregation set about the joy of worship amid the hardships of making a new life for themselves. For many years the services were conducted in german but were gradually replaced by english and the first minutes of a meeting written in English were recorded in 1925.
where the present manse now stands. Even when a provisional or state school opened the children still attended the german school one day per week. Parents learned their english from their children. These early families had a challenging life but their love of God and family and their goodwill to one another saw the area prosper. Over the years the floods of 1887, 1947 and 1974 have caused havoc in the area. In January 1887 when 10″ (266 mm) of rain fell in 10 hours, the new church became home to seven families after they lost their homes and posessions to the river. At times like these the church community rallies together to provide food and clothing to those in need and God provided with large numbers of lobsters in the puddles and a pig that was found floating on some logs and rubbish. In 1919 the German school was demolished to make way for the manse. The manse was erected and dedicated on Palm Sunday 1920, followed by the erection of a stable, buggy shed and fence. The members of St. Peters have always been generous, fun loving people ready to put their own needs behind that of their church. For the 50th Anniversary in 1937 the church was lined, a new altar was installed in 1940 and in 1954 the windows were replaced with the present ones depicting the cross design. Various renovations were carried out over the years rendering the care and attention given voluntarily by members. which was added to the Glory of God in 1999.
the world to open up a new country where they could freely worship their Lord. We also thank those who have upheld the faith over the years and met the changes that have occured in our community. The one thing that has always remained a constant, is Jesus: as the verse at the front of St. Peters church indicates “Jesus, the same, yesterday, today and forever”. Hebrews 13:8. We pray that by thegrace of God we are able to continue the work of the Lord following in the footsteps of our Forefathers and through the word and the sacraments prepare to meet them and come into the glory of the Lords presence with exceeding joy. Over the years the members have had joy in caring for their church and providing facilities for the activities of the congregation. Generous hearts have been evident in the donation of items including church furnishings timber for buildings and renovations and hours of voluntary labour. Through the generations, traditions have been preserved and although services in the German language have long ceased, music still plays an important part in the worship life of the people following in the path of the early settlers who, having no organ, formed a brass band to compliment their services. It was said that the singing from the first Elkana church could be heard by the punts on the river. “If we rise on the wings of the dawn, If I settle on the far side of the sea, even there your hand will hold me fast.” Psalm 139:7,9,10. 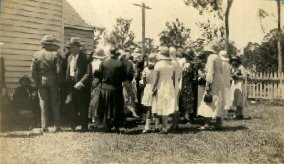 Originally known as ‘Pimpama Island’, the Woongoolba area was settled by German immigrant families in the 1870s. 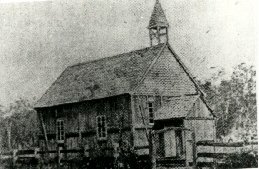 Services were conducted in homes until a church was erected in 1882. This building served until the present church was erected in 1908. It was extensively renovated in 1930. The former St. Johnn’s Steiglitz amalgamated with Bethlehem in 1959 and St. John’s, Norwell, joined in 1973. 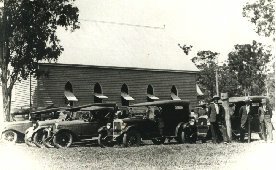 At various times, congregations at Oxenford, Southport, Mullumbinby, Canungra and Beaudesert have been served from the Alberton Parish. The congregation has had anniversaries for its 50th, 75th and 100th years of the dedication of the church as well as celebrating 125 years of Lutheran settlement. The Christian values of the past are still cherished and many families have children attending Bethania Lutheran Primary School and Redeemer College at Rochedale. Over the years, many people have been welcomed into the congregation and we are now made up of people from various different backgrounds which enhances our outlook and commitment. Many members have passed on or left the district, however many descendants of original settlers still reside in the area and many new families have been welcomed.. The heritage that bonded the people together in a new and strange land helped to securely build a foundation in which the basics for the Christian faith are still being laid today. God be praised that he has not withdrawn his grace, but in mercy spared us and that His word has been proclaimed in this area for some 125 uninterrupted years. Let us pay tribute to the memory of the pioneers who sailed half way around the world to open up a new country so their descendants could live in a free world and raise their children in a healthy climate and under the word of God. As many changes as there have been, the Gospel of Jesus Christ does not change and it is by God’s love and mercy that we continue to live and worship in this wonderful area. We pray that by the grace of God we are able to continue the work of the Lord following in the footsteps of our forefathers and through the word and the sacraments, prepare to meet them and come into the glory of the Lord’s presence with exceeding joy.